Fort Greene Ville (1793-1796) - Established in 1793 by General "Mad" Anthony Wayne during the Northwest Territory Indian War. Named after General Nathanael Greene Abandoned in 1796. General "Mad" Anthony Wayne ordered the construction of Fort Greene Ville in 1793 during the Northwest Territory Indian War. The post was laid out much like a small city with a block like plan and was one of the largest wooden fortification ever built. The rectangular stockade enclosed 55 acres with walls 1,800' long, 900' wide and 10' high. The post could support the four sub Legions of General Wayne's Legion. A double row of cabins, each housing 10 men, ran around the inside of the exterior walls. Each corner had a bastion and blockhouses were built into the central wall of each side. Eight redoubts, each complete with a blockhouse, surrounded the main stockade. 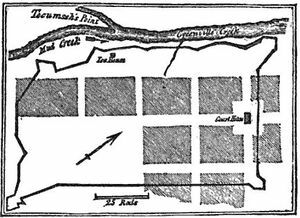 The Treaty of Greene Ville was signed on 3 Aug 1795 at Fort Greene Ville, ending the war. The fort was abandoned the next year and settlers descended on it stripping it of construction materials and finally burning it down to scavenge metal hardware. Marker only. No period guns or mounts in place. Location: Greenville, Darke County, Ohio. This page was last modified 21:00, 24 March 2019 by John Stanton.